I’ve been reaching into my pocket a bit more than usual the last two weeks -- I find it’s a helpful way of taking care of myself when people I care about need an emotional anchor. Sometimes the idea or image I turn to for comfort is not fully developed. It might just be the essence of a concept or, in some cases, a tiny, little seed. Recently, I heard Jackson Gillman tell about his experience listening to a powerful one word story. It made me realize that the kernel of a story can actually be its heart. I hope it can buoy you as it has been buoying me. P.S. I want to give credit where credit is due. The cocoon image is taken from a photograph by Greyson Orlando. 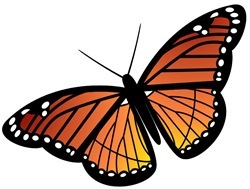 The caterpillar and butterfly are the results of my fledgling path toward learning vector based graphics. Keeping our brain in shape? Maybe.